Kaiparowits Plateau holds a well-preserved, 25 million-year record of prehistoric animals living during the key Late Cretaceous period — along with most of Utah’s untapped coal reserves. 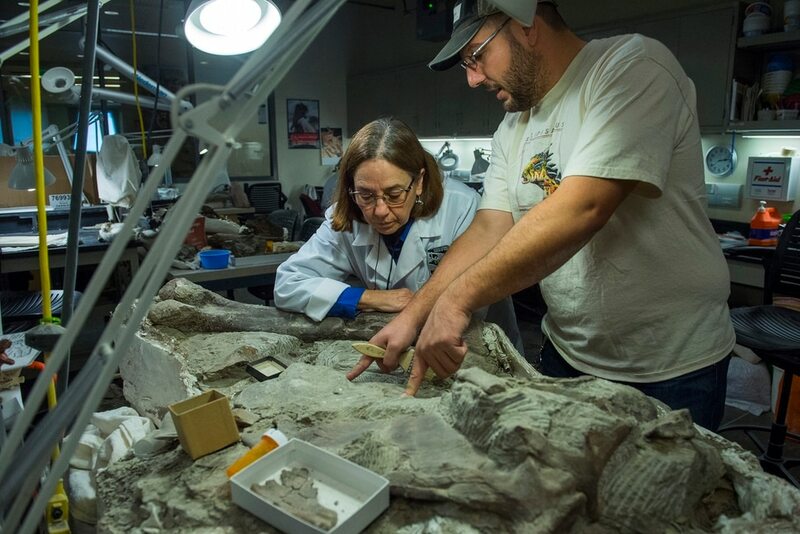 (Chris Detrick | The Salt Lake Tribune) Fossil Preparation Lab Manager Tylor Birthisel and volunteer Ann Johnson work on a Tyrannosaurid skull from Grand Staircase-Escalante National Monument at the Natural History Museum of Utah. (Chris Detrick | The Salt Lake Tribune) Paleontology volunteer Randy Johnson holds part of a 75 million-year-old Pentaceratops skull he discovered in the Grand Staircase-Escalante National Monument at the Natural History Museum of Utah. (Chris Detrick | The Salt Lake Tribune) A Diabloceratops eatoni skull discovered in the Grand Staircase-Escalante National Monument at the Natural History Museum of Utah. 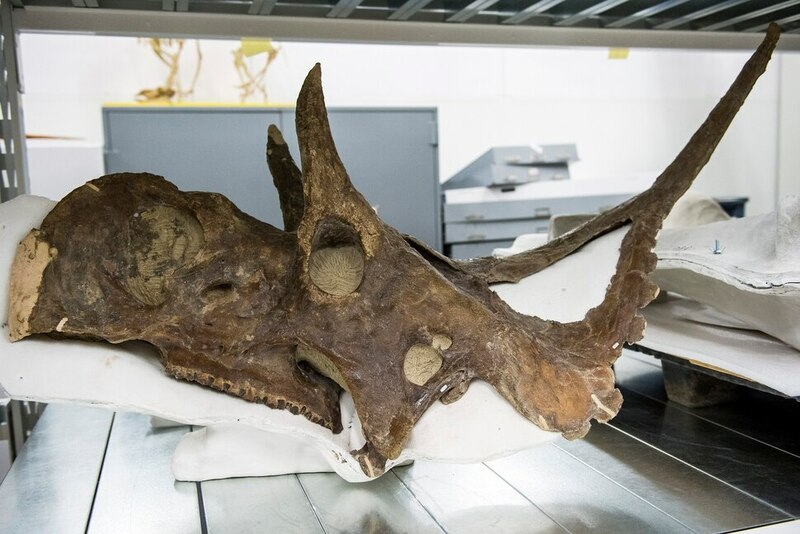 (Chris Detrick | The Salt Lake Tribune) A 76 million-year-old Kosmoceratops richardsoni skull discovered in the Grand Staircase-Escalante National Monument at the Natural History Museum of Utah. 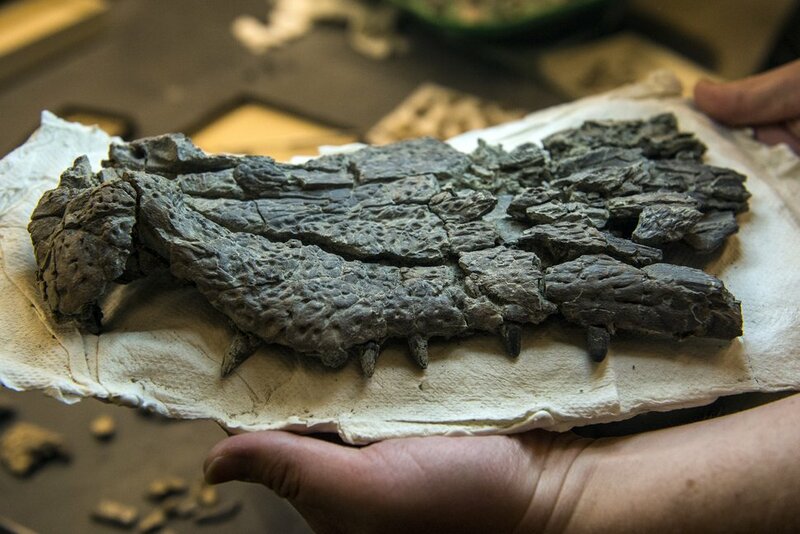 (Chris Detrick | The Salt Lake Tribune) Part of a 210 million-year-old Phytosaur skull discovered in Indian Creek at the Natural History Museum of Utah. 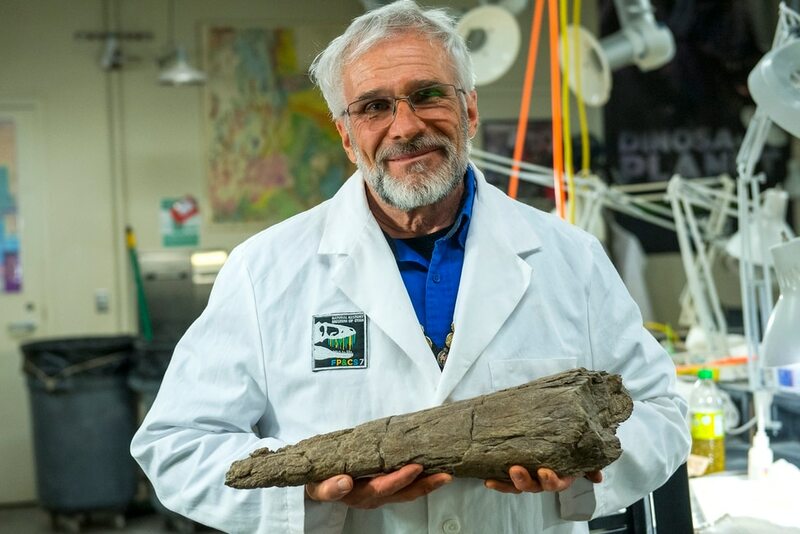 (Chris Detrick | The Salt Lake Tribune) Chief Curator/Curator of Paleontology Randall Irmis holds a Gryposaur skin impression discovered in the Grand Staircase-Escalante National Monument at the Natural History Museum of Utah. (Chris Detrick | The Salt Lake Tribune) A Tyrannosaurid skull from Grand Staircase-Escalante National Monument at the Natural History Museum of Utah. (Chris Detrick | The Salt Lake Tribune) Part of a crocodilian fossil at the Natural History Museum of Utah. (Chris Detrick | The Salt Lake Tribune) A Tyrannosaurid tibia and fibula from Grand Staircase-Escalante National Monument at the Natural History Museum of Utah. (Chris Detrick | The Salt Lake Tribune) Part of a ~80 million-year-old Parasaurolophus skull from the Grand Staircase-Escalante National Monument at the Natural History Museum of Utah. (Chris Detrick | The Salt Lake Tribune) Part of a Tyrannosaurid tail from Grand Staircase-Escalante National Monument at the Natural History Museum of Utah. (Chris Detrick | The Salt Lake Tribune) Paleontology volunteer Randy Johnson holds part of a 75 million-year-old Pentaceratops skull he discovered in the Grand Staircase-Escalante National Monument at the Natural History Museum of Utah. Randy Irmis rubbed his fingers over bumpy imprints of the scaly skin of a creature that lived 76 million years ago, once roaming what is now Utah’s Kaiparowits Plateau. Dinosaur skin is a rare find, the Natural History Museum of Utah paleontologist says, but not in that desolate corner of Grand Staircase-Escalante National Monument. Conditions for fossilizing remains of dinosaurs and many other animals were so good in the region, says Irmis, that at least half the duck-billed dinosaur specimens recovered there have skin. “With so many skin impressions, we have been able to tell species’ specific features from their skin,” he said recently while touring the Salt Lake City museum’s collections, which house 2,000 fossils recovered from the Kaiparowits since the monument was designated in 1996. Those intervening two decades have seen a flood of scientific discoveries pour out of the remote high desert plateau, which also harbors a fossil bounty of another kind — vast reserves of coal. A 1,650 square-mile triangle bounded by the Straight Cliffs on the east and the Cockscomb on the west, the Kaiparowits contains an unbroken fossil record spanning about 25 million years of the Late Cretaceous, from 100 million to 75 million years ago — an era when ecosystems first emerged that we would recognize today, filled with flowering plants and familiar backboned animals like lizards, snakes, amphibians, turtles and mammals. 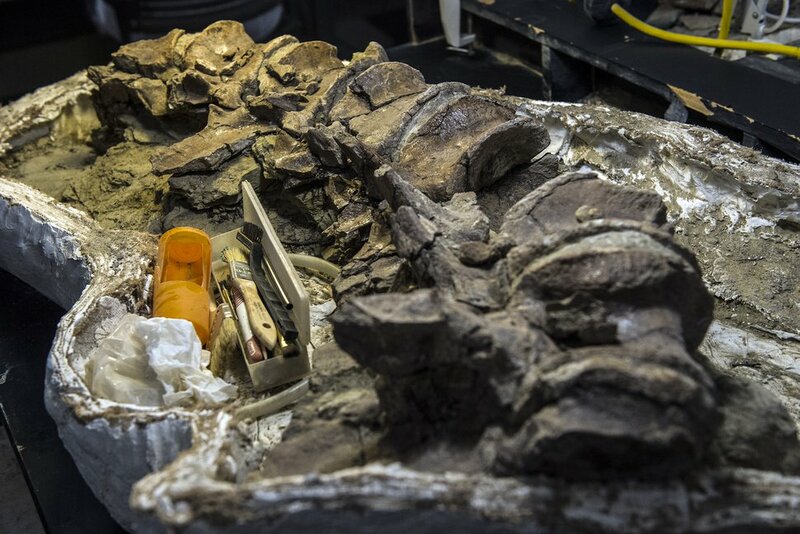 “It has really transformed how we understand the Late Cretaceous and its extinction events and what happened after the extinction events,” says David Polly, president of the Society of Vertebrate Paleontology. (Chris Detrick | The Salt Lake Tribune) A Diabloceratops eatoni skull discovered in the Grand Staircase-Escalante National Monument at the Natural History Museum of Utah Wednesday, November 29, 2017. On Monday, Trump flew to Utah and signed proclamations breaking the once 1.35 million-acre Bears Ears National Monument into two monuments, totaling 201,876 acres. He also trimmed the Grand Staircase-Escalante from 1.9 million acres to about 1 million, segmenting it into three smaller monuments, including a new Kaiparowits National Monument covering 551,034 acres. The redrawn Kaiparowits preserve resembles a jigsaw puzzle piece with large areas carved out. Maps reveal that some of those carve-outs, such as Alvey Wash, overlap with mineable coal seams and old mineral leases. According to analyses by the environmental group Southern Utah Wilderness Alliance and others, retired oil and gas leases on the plateau also match up neatly with areas excised from the monument by Trump’s decree. The Society of Vertebrate Paleontology — a global organization of scientists, students, artists, writers and other scholars dedicated to the discovery, study and preservation of vertebrate fossils — has joined Conservation Lands Foundation and Grand Staircase Escalante Partners in a federal lawsuit aimed at blocking the Interior Department from cutting the monument by half. Their legal challenge was one of five filed as of Friday against the Utah monument reductions. (Chris Detrick | The Salt Lake Tribune) Part of a crocodilian fossil at the Natural History Museum of Utah Wednesday, November 29, 2017. Fossils are not a resource whose extraction can generate jobs and economic activity the way fossil fuels and other mineral resources can. President Bill Clinton’s surprise monument proclamation in 1996 stung southern Utah’s Kane and Garfield counties, whose leaders deeply resented the subsequent loss of two proposed coal mines and the jobs they promised. Under the Kaiparowits are massive deposits of high-quality coal that account for about two-thirds of Utah’s known reserves. About 22 billion tons lies in mineable seams, at least four feet thick, and about half that is deemed “recoverable,” according to the Utah Geological Survey. The coal is located in the Straight Cliffs Formation, deposited between 95 million and 80 million years ago and is immediately below the sedimentary formations — Kaiparowits and Wahweap — that are yielding headline-grabbing dinosaur discoveries. The minable coal deposits tend to be on the east side of the Smoky Mountain Road that traverses the plateau north to south, connecting the rural communities of Escalante and Big Water. One state official insists that separation makes the potential threat to fossil treasures from coal mining relatively small. The Kaiparowits coal beds formed in coastal mangrove and cypress swamps, where plant material was preserved and later fossilized into the black rock rich in carbon. Vertebrate fossils are not often found in coal deposits because the swamps filled with decaying plants were so acidic that conditions eroded bones away before they could fossilize, according to Kirkland. (Chris Detrick | The Salt Lake Tribune) Part of a Tyrannosaurid tail from Grand Staircase-Escalante National Monument at the Natural History Museum of Utah Wednesday, November 29, 2017. But Irmis, with the Natural History Museum of Utah, is not convinced. Coal-rich portions of the Kaiparowits have not been scoured for fossils yet, he noted, and the fraction of the plateau already surveyed has yielded thousands of specimens. Paleontologists have identified 964 sites on the plateau that have so far produced 2,000 specimens now in the museum’s collections. Other museums working the Kaiparowits include the Denver Museum of Nature and Science and California’s Raymond Alf Museum of Paleontology. The redrawn monument boundaries also worry Utah paleontologist Jeff Eaton, a mammals specialist who conducted some of the first research on the plateau with his wife, Linda, in the 1980s. The Eatons are credited with initially alerting the Clinton administration to the Kaiparowits’ scientific values, then under threat from the proposed Andalex coal mine at Smoky Hollow. Portions of Eaton’s writings on the plateau’s scientific importance were, in fact, included in Clinton’s 1996 proclamation designating Grand Staircase as a national monument. He considers the beautiful landscapes on either side — the Escalante Canyons to the northeast and the Grand Staircase to the west — to be “add-ons” to the monument, better known for their scenic qualities than their scientific resources. Coal industry supporters say the Kaiparowits reserves lie hundreds of feet below and would be mined using underground longwall operations that would not disturb the surface except at key points of entry. But environmentalists reject that assertion and note that mining isn’t the only threat to the area; Trump’s decision also opens it to potential oil and gas drilling. Others note the value to science of protecting places where fossils have been excavated. Given the declining interest in coal and the remoteness the Kaiparowits deposits, many say it is unlikely they would be tapped anytime soon — but the possibility still has scientists on edge. Correction: The final quote in this story was from Utah paleontologist Jeff Eaton. An earlier version mis-attributed the quote.